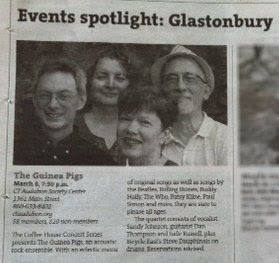 The Glastonbury Life is talking Guinea Pigs! We're playing the CT Audubon Center, Friday, March 8, from 7:30 - 9:30 pm. $8 members / $10 non-members. Come on down for a little Guinea Pig magic and fun, in a wonderful space!